Editors note: This is the first installment of a 2-part series by Dr. D'Adamo exploring the connection between blood types and the microbiome. Part 2 of the article will run in our June 2015 issue. Although most health consumers are aware of the benefits of 'essential' fatty acids (such as linoleic acid and alpha-linolenic acid) and the 'conditionally essential' fatty acids (such as the omega-3s) few are aware of the tremendous importance of the short chain fatty acids (SCFAs). Unlike the EFAs which are long chains of over twenty hydrocarbons, SCFAs are much smaller, often only having three or four hydrocarbons. Because of their small size SCFAs are easily made by bacteria as part of their own life cycle (as fermentation byproducts). The two principal SCFAs with biological activity are propionic acid and butyric acid. Propionic acid (PA) is commonly found on the skin, where it can be produced by bacteria. PA inhibits the growth of mold and some bacteria and is a common preservative for both animal feed and food for human consumption. We mammals have a long history with butyrate. It has been in our gut for so long that the lining of our colon has evolved to use it as its primary source of energy. Without butyrate for energy, our colon cells undergo a self-destruction cycle and eventually die. With butyrate, the colon cells can grow and develop normally, better control the permeability of the gut, and regulate inflammation. Butyrate also have effects upon gene regulation and may play an important role in sugar regulation. Although the common conception about the health benefits of fiber are based more or less on the idea of fiber having a 'scrubbing' effect on the gut, its main health benefit is increasingly being viewed as its ability to act as a source for the production of butyrate. 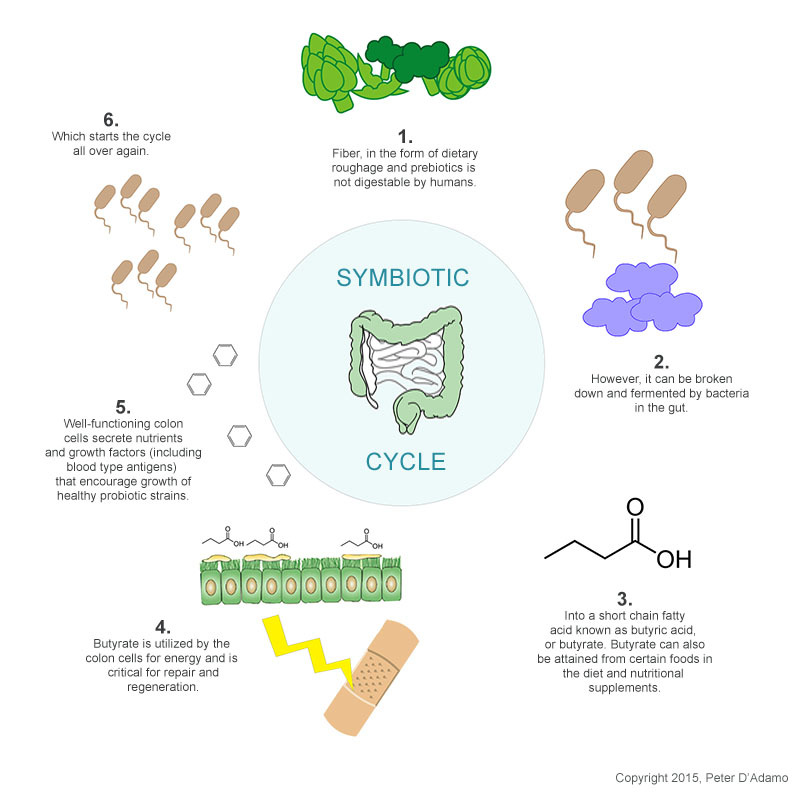 Butyrate is part of a 'symbiotic cycle' that serves to keep the gut healthy: Bacteria produce butyrate, which nourishes the colon cells, which produce other factors (including elements of our blood type) that encourage the balance of beneficial flora. Knock out one part of the cycle and the whole thing stops working. Bacterial fermentation of the fiber we ingest in our diet. Dietary fiber, by definition, cannot be digested and broken down by the body (which is why it is fiber.) On the other hand, bacteria in the colon can breakdown the fiber that we consume into simpler carbohydrates, and one of the results is butyric acid. Butyric acid is an amazingly bad-smelling substance: in fact it is one of the reasons why a teenagers gym sneakers often smell so bad. Adolescents have a higher concentration of sugar in their perspiration, and the bacteria in the sneakers convert some of it into butyric acid. Many of the so-called 'pre-biotics,' foods that encourage the growth of healthy bacteria in the gut, are also great starting points for the production of butyrate. Foods and supplements: Butyrate also occurs in significant amounts in food. Butter is 3-4 percent butyrate, and not surprisingly, many of the odiferous, pungent cheeses (such as parmesan) are also sources. Although butyrate is available in supplement form, their use is not widespread and consumer awareness of their great health benefits is quite low. In many situations, dietary sources will not be sufficient to correct an imbalance, but are often adequate to help maintain a healthy ecosystem. A healthy gut requires more than just a probiotic. Just like any ecosystem, one cannot simply change one element and expect it to produce an effect on the entire system. Rather, just like a garden, the gut must be tended. Following the dietary recommendations for you blood type (and secretor status) is a great starting point. Adding a blood type specific probiotic (with blood type specific prebiotics) takes the level of care deeper. Finally, insuring that there is adequate opportunity for the production of butyrate completes the cycle. In disrupted situations (known as dysbiosis) adding a butyrate supplement may be necessary to 'prime the pump,' allowing the de-energized gut lining an opportunity to rebuild and regenerate. In situations like this, a butyrate supplement can help to get the 'motor to turn over' and give the system a chance to rebalance itself naturally. People of different blood types have different gut bacteria. In fact, certain bacteria are 50,000 times more likely to turn up in people with one blood type than another. This originated from our ancestors whose digestive tracts developed to accommodate one type of diet over another, and whose immune systems developed an ability to reject or co-exist with certain bacteria, but not others. Our blood type can actually 'seed' our gut by encouraging the growth of only those bacteria strains that can use our blood type antigens as a source of food, while our anti-blood type antibodies will attack bacteria that carry antigens resembling those of an opposing blood type. Many avoid food contain lectins that can encourage the growth of problematic strains of bacteria, leading to 'leaky gut' and dysbiosis. This is why the first line of support for healing your digestive tract and building a healthy microbiome is eating the right foods for your blood type. Get dirty...literally! Connect yourself to the earth, whether it is gardening, planting, mowing the lawn. Find ways to connect to the natural microbiome in nature. Feed the good microbes...in addition to the blood type diet right for your type; add in a healthy serving of pre- and pro-biotics, designed right for you. Avoid antibiotics, which can strip your gut of these important microbes and leave you open to other opportunistic infections. Heal your gut. If you have had any on-going digestive problems, the time is now to heal it. Follow a blood type specific food plan for three months to support your healthy digestive processes. Supplement with butyric acid and short chain fatty acids, long known in their ability to nourish the cells of the colon and support the process of balancing the beneficial flora of the gut. Practice joy. While it is difficult to correlate happiness to gut health, it certainly makes the journey to health much more enriching and satisfying! May is a great time to get into the garden, to eat right, to tend to your gut, and to smile as if you really mean it – in doing so, you will. 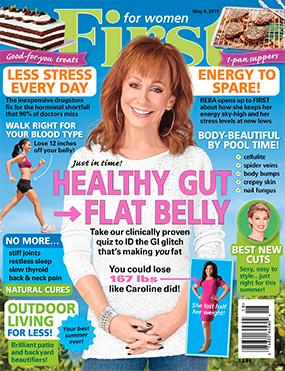 The April 18th issue of First for Women featured a great article about the benefits of walking right for your type, as a way to lose weight and keep it off. Dr. D'Adamo was interviewed for the article, Daisy Velas Boyce, is profiled. Daisy lost 59 pounds following the Blood Type Diet, and she is quite an inspiration to all of us! The Daily Mail featured a sneak peak at the April issue of Harper's Bazaar/AU, which featured an article on Super-model Shanina Shaik. She credits following the Blood Type Diet of part of her heath regimen. Shaik joins a growing list of super-models who follow the diet as a way to maintain their health and runway shapes. Wash kale and dry on kitchen towels. Strip kale off the wood stems by holding the stem with one hand, wrapping finger and thumb of the other hand around the stem, and pulling quickly down. Discard stem and tear leaves into bite-size pieces. Place in a large bowl and set aside. Heat olive oil in a skillet over medium heat. Add onion, and sauté 3 to 4 minutes. And raisins, and continue cooking for 5 minutes. Remove from heat and toss with raw kale. In a small bowl, whisk together dressing ingredients. Drizzle over kale salad and toss to coat. Serve with leftover or chilled baked salmon or beans for added protein.